Climate change is a moral, ethical, and socio-economic issue. The wealthiest nations, those who are the most responsible for the increased output of greenhouse gases, will be the least affected by climate change. They will also be the most equipped to deal with the consequences. In stark contrast, those that are the most impoverished have the smallest carbon footprint and are the most affected by climate change. Alone, they do not have the resources to face the dire consequences of climate change. The impact of climate change on the developing world was the focus of a recent exhibit and campaign “One Planet, One Chance” created by Zago, based on the Human Development Report 2007/2008 from the United Nations Development Programme (UNDP). The following are excerpts from the exhibit publication, comprehensive on its own, but only a taste of what you’ll find in the full report. In many countries, poverty is intimately related to repeated exposure to climate risks. For people whose livelihoods depend on agriculture, variable and uncertain rainfall is a potent source of vulnerability. Across the world, the lives of the poor are punctuated by the risks and vulnerabilities that come with an uncertain climate. Climate change will gradually ratchet up these risks and vulnerabilities, putting pressure on already over-stretched coping strategies and magnifying inequalities based on gender and other markers for disadvantage. Who are some of the people affected? It is hard to overstate the implications for human development. Climate change impacts will be superimposed on a country marked by high levels of vulnerability, including poor nutrition and among the world’s most intense HIV/AIDS crisis: almost one million people are living with the disease. Poverty is endemic. Two in every three Malawians live below the national poverty line. The country ranks 164 out of the 177 countries measured in the HDI. Life expectancy has fallen to about 46 years. Climate change threatens to reinforce the already powerful cycles of deprivation created by drought and flood. Incremental risks will be superimposed upon a society marked by deep vulnerabilities. In a ‘normal’ year, two-thirds of households are unable to produce enough maize to cover household needs. Declining soil fertility, associated with limited access to fertilizer, credit and other inputs, has reduced maize production from 2.0 tonnes per hectare to 0.8 tonnes over the past two decades. Productivity losses linked to reduced rainfall will make a bad situation far worse. The hurricane impacted the lives of some of the poorest and most vulnerable people in the world’s richest nation. Pre-Katrina child poverty rates in New Orleans were among the highest in the United States, with one in three living below the poverty line. Health provision was limited, with some 750,000 people lacking insurance coverage. Hurricane Katrina selected its victims overwhelmingly from the most disadvantaged areas of the city. Poorer districts dominated by black communities bore the brunt. Flood damage interacted with deep racial inequalities (poverty rates among blacks three times higher than for whites). An estimated 75 percent of the population living in flooded neighbourhoods was black. The Lower Ninth Ward and the Desire/Florida communities, two of the poorest and most vulnerable in the city, were both totally devastated by Katrina. Future generations will pass harsh judgement on a generation that looked at the evidence on climate change, understood the consequences and then continued on a path that consigned millions of the world’s most vulnerable people to poverty and exposed future generations to the risk of ecological disaster. If we value the well-being of our children and grandchildren, even small risks of catastrophic events merit a precautionary approach. Climate change mitigation is about transforming the way that we produce and use energy. It is about living within the bounds of ecological sustainability. The starting point: putting a price on carbon emissions. Changed incentive structures are a vital condition for an accelerated transition to low carbon growth. 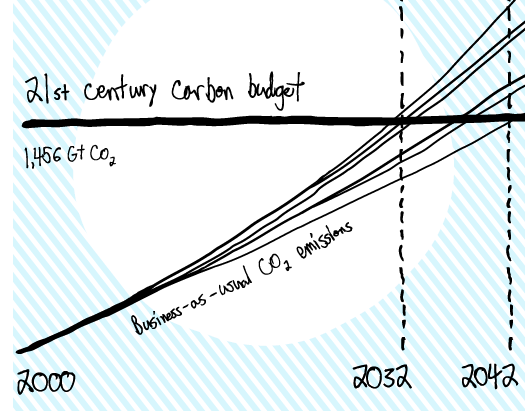 In an optimal scenario, the carbon price would be global. This is politically unrealistic in the short-run because the world lacks the required governance system. The more realistic option is for rich countries to develop carbon pricing structures. As these structures evolve, developing countries could be integrated over time as institutional conditions allow. If we are to succeed in tackling climate change we have to start by setting out the ground rules. Any international strategy has to be built on the foundations of fairness, social justice and equity. These are not abstract ideas. They are guides to action. The importance of early and concerted action. The carbon budget is best understood as the global maximum amount of CO2 emissions that can be produced, and therefore absorbed by the Earth’s atmosphere and ecosystems, in order to avoid dangerous climate change. Briefly summarized, the 21st Century budget amounts to 1,456 Gt CO2, or around 14.5 Gt CO2 on a simple annual average basis. Current emissions are running at twice this level. We only have one planet — and we need a one-planet solution for climate change. That solution cannot come at the expense of the world’s poorest countries and poorest people. 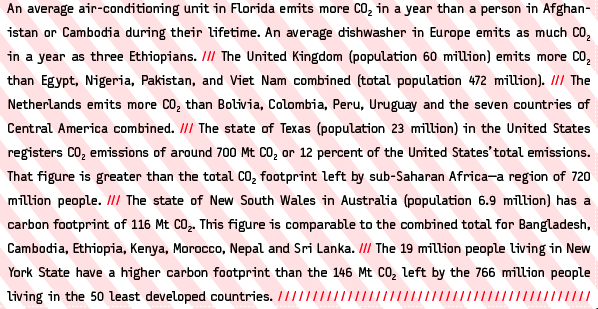 Developed countries have to demonstrate that they are serious by cutting their emissions. After all, they have the financial and the technological resources needed to act. Read the rest of the exhibit brochure. Read the summary or the full report.